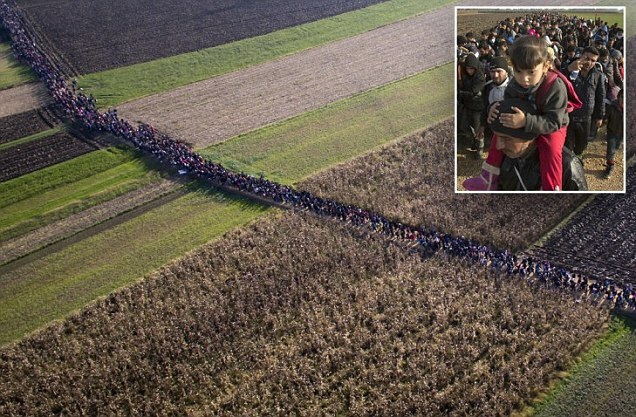 THE LONG MARCH: PHOTOS OF MUSLIM SETTLERS SLOGGING INTO EUROPE……. – The Tundra Tabloids……. THE LONG MARCH: PHOTOS OF MUSLIM SETTLERS SLOGGING INTO EUROPE……. The nightmare continues in spite of the lack of attention. Battling strong winds, driving rain, mud and freezing temperatures, these stunning photographs show a slow trek of thousands of migrants making their way to Europe amid the harsh conditions of the oncoming winter. As European leaders squabble about how best to deal with its mounting refugee crisis, tens of thousands of people are continuing to try and reach the Eurozone via the Balkans route. Previous Post Previous Post MORDECHAI KEDAR ON ISLAM AND THE MUSLIM MENTALITY…………. Next Post Next Post ISLAMIC STATE AIRS VIDEO OF EXECUTION OF MAN BEING RUN OVER BY TANK…….